Snowshoe hare is an amazing species of mammals. Both looks wise and traits wise this species is awe-inspiring. Found in cold temperature zones of the world, this species is designed to cop up with the cold and the snow. This incredible species have many traits that make it outstanding amongst the usual mammals. Looks : Snowshoe Hares are bigger in size than rabbits. They have a thick coat of fir. Limbs : These hares have huge hind limbs and big enough forelimbs also. Their feet are furry, helping them to hop around without sinking in snow-bed. 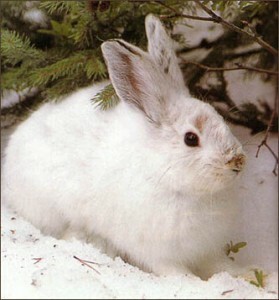 Body : During winters body of Snowshoe hares are covered with thick coat of snow white fur. As it approaches summer-time, their fur-cover color changes to brownish. 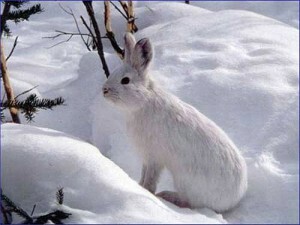 Size : An average snowshoe hare is 16cm to 20cm in height. Weight : An average snowshoe hare weighs about 2lbs to 4lbs. Snowshoe hares species are to be found all over Canada, New England, south from the Rocky Mountain, and Appalachian Mountain. This species is abundantly found in the northern countries of New Hemisphere. Snowshoe hares are herbivorous. They feed on grass, flowers, greens, etc. in summers. In winters it is hard to find greens around. That time they survive on buds, soft bark, and twigs. Snowshoe hare is a very interesting animal. Their ways and behavior are very interesting to observe. Snowshoe hares are very social animals. They are very fast runners. They are capable of running bout 27mph. They are also high jumpers. They can jump up till 10ft high. They can also swim very nice. They have different diet habits for winters and summers. Their habitat habit is very consistent. They stick to one habitat location round a year at the least. These hares stay active throughout the year. They are mostly active during night, dusk, or dawn. 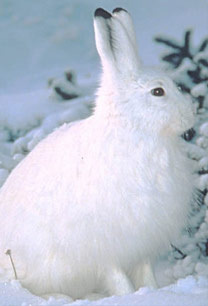 The Snowshoe hare species is threatened by humans occasionally for maritime hunting and even diet. But the biggest threats to this species are the carnivorous ones of the animal kingdom, both mammals and birds. The list includes owls, hawks, and eagles amongst birds. Amongst the bigger ones there are lynx, wolves, coyotes, foxes, mountain lions, martens, weasels, and bobcats. Snowshoe hare have many special features that help them adapt to the environment as well as sense danger and threat from carnivorous species of the animal kingdom. The species acquire thick fur coat in winter which protects them from the cold. In summers, their fur coat becomes less furry to accustom to the heat. They have small teeth behind their strong and big ones in the front, for cutting the food. Their fur coat changes color varying with the season. In winters their fur coats are snow-white, and in summers their fur coats get brownish. This phenomenon helps them camouflage with their surroundings accordingly. Their hind limbs are like snowshoes that help them hop around on snow-bed in winters. Snowshoe hares have long ears that enable them to assemble sounds from distance also. Their whiskers and nose are designed to sense danger. They can hop and run very fast both on greens and on snow. They plunge into water to escape from their predators. Snowshoe hares prefer lowland areas of spruce-fir woods, and mixed hardwoods. They also inhabit in forest burns, blown-downs, and clear-cuts. There is one thing about their habitat preferences that is they tend to stay away from open spaces. They need hide out kind of places. Snowshoe hares reach reproductive maturity in the very next spring from their birth since they have a very short life span. They breed from March beginning to August end. The male snowshoe hares chase the female ones through the woods and then purse the females to mate. The gestation period lasts for about 36days. The female Snowshoe hares give birth to 3-4young ones. The nascent born ones are precocial, with open eyes and weigh 2 ½ ounces. They start hopping soon after their birth. Male snowshoe hares compete amongst themselves for the female ones. Each male hare might mate with many female ones. Snowshoe hares do not have a long life span. It varies between 1year and 3years. According to IUCN reports it comes under the least concern category. The species do not suffer any major threat apart from the natural ones, like being preyed by other carnivorous animals. Snowshoe hare derives its name from its physical feature. Its feet are designed like snowshoes. It has a very short life span of less than even 3yrs. The species reach sexual maturity very fast within a year’s age. The fur-coat’s color of Snowshoe hare changes with season. They are very territorial in nature, and do not change their homes. Each male snowshoe hare competes with many to mate with a single female hare. 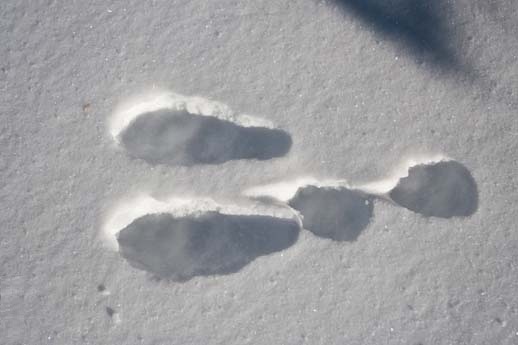 Snowshoe hare species are fast runners, high jumpers and good swimmers. Take a look of the amazing Snowshoe hare species in the pictures below. Hello, i am wondering if i could use some of your information and pictures for my website about the snowshoe hare. 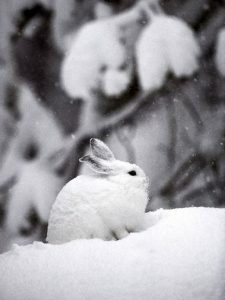 I currently enrolled in UW-Lacrosse and am working on a website about the snowshoe hare and would appreciate it if i could use some of the images on this website. All credit would go to the photographer, and would hyperlink parts of my website back to this one.